"It's been a hard day's night and I've been working like a dog"
In English, whenever we want to compare two things to each other we can use a simile. The main difference between a simile and a metaphor is that the comparison in similes is always indirect. In fact we need to employ words like ‘as', ‘like' or ‘than'. On the other hand, the writer or speaker using a metaphor would be implying that something IS something else. In the first example we have a metaphor (because life is being directly compared to a journey. The second and third examples are similes and this is illustrated by the fact that both examples include ‘like' or ‘as'. "One of the new things people began to find out in the last century was that thoughts -just mere thoughts - are as powerful as electric batteries - as good for one as sunlight is, or as bad for one as poison." from The Secret Garden, by Frances Hodgson Burnett. Apart from the fact that this quotation itself contains a number of similes, the importance lies in the feeling that is conveyed. 1. Thoughts are very important. 2. "Thoughts, just mere thoughts, are as powerful as electric batteries, as good for one as sunlight is, or as bad for one as poison." I'm pretty sure you would agree with me in saying that the second sentence is much more powerful and it explains the idea of how important thoughts are much more clearly and vividly. 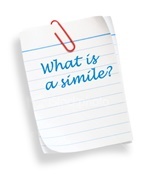 So to sum up, this is the main reason for the use of similes, and this is also why similes are very commonly found in the works of literature's most important contributors - they make their readers FEEL the message that they want to convey....and this is by far more effective that phrases which are straight and to the point. Try and think of what the meaning of these similes could be. If you have any difficulty, post a comment or leave a message to find out your answer. 1. They are as alike as two peas in a pod. 2. It is bitter like gall. 3. She is busier than a bee. 4. He is as deaf as a doorpost. 5. Joe is as mad as a hatter. 6. As happy as Larry. 7. As poor as a church mouse. 8. As wise as Solomon. 9. As keen as mustard. 10. As stiff as poker.